I love soups, (see a few reasons why in my Dietitian’s Kitchen post). In short, they’re healthy, cheap and easy to make. I started making soups when I was about 16 and became interested in eating healthily. Then, when I was at university, I found that I could pretty much chuck any vegetables in with some suitable spices or herbs and it’d taste good, so soups became a go-to. I find it very difficult to go wrong because as long as you don’t add too much of something, you can continually adjust the flavours as you go. In basis, every soup I make starts out with the same base; onion and garlic. Then I just throw in the vegetables, add a protein (meat, pulses or lentils), add spices, season, cover it in stock and let the vegetables soften. Sometimes, if I’m not going to be having bread with it I’ll add in potato, rice or noodles. My favourite is when I use a chicken carcass to make a tasty chicken soup, mmhm. 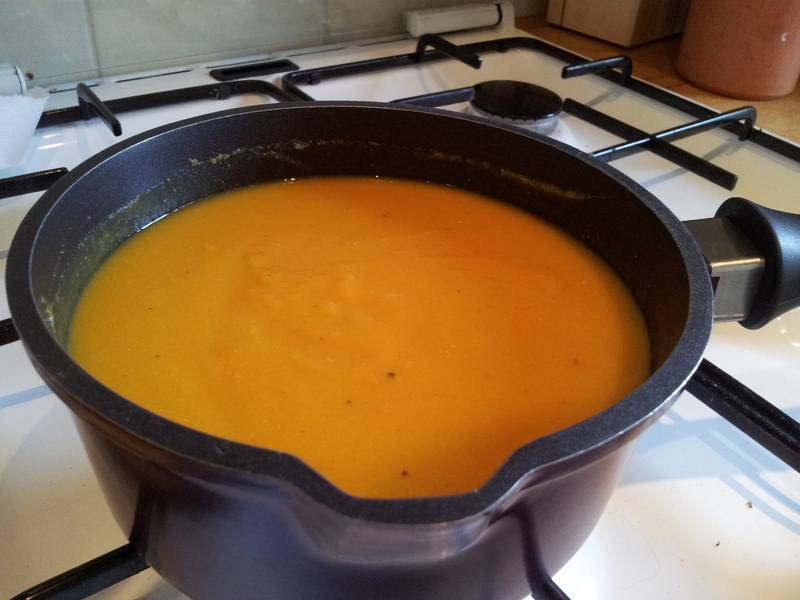 This soup recipe is using a butternut squash; another firm favourite of mine, especially during those Winter months. This is low in calories, high in fibre and packed with vitamins A and C. This soup contains some protein in the lentils, but I’d recommend another source of protein (boiled egg, 25g of nuts or more lentils) if you’re having this as a main meal. Team with a slice of wholegrain bread for a lovely lunch. By the way, I always make soup on mass and freeze or refrigerate it. So you’ll find this recipe makes loads! 2. Peel the squash and chop off both ends. 3. Slice the squash down the middle (length-ways) and scoop out all the seeds and pith in the middle. 4. Chop squash roughly into 1 inch cubes. 5. Drizzle a little (around 2 tablespoons) of olive oil into an oven proof dish and add the squash. Sprinkle with some paprika, ground pepper and a little salt. Place in the oven for around 1 hour or until the squash is soft and just beginning to brown. 6. While the squash is roasting, chop up the rest of your vegetables. 7. Add a tablespoon of olive oil to a large saucepan (big enough to hold all of the soup) and add the garlic, chopped onions and oregano. Heat on a low-medium heat until the onions appear to have a slight glaze. 8. Once the squash is ready, add it to the saucepan along with all of the other vegetables and lentils. Give it all a good mix. 9. Pour over the stock and enough water to cover the vegetables (you may need to add more if you want a runnier soup). 10. Leave the soup to simmer until all the vegetables are cooked. 12. When you’re ready to eat, reheat, stir in the turmeric and add a dash of yoghurt to make it taste even more creamy. Voilà…Yum!